The City of Jeffersonville would like to recognize the Jeffersonville Police Department SWAT Team recent participation in the state’s annual Indiana SWAT Challenge, an annual competition that was held this year in Muncie, Indiana on September 6th – 8th. JPD Swat Commander Josh Lynch, Officers Justin Salsbury, Shaune Davis, Steve Cooper, Kenton Makowsky, Sam Moss, and Joe Hubbard represented the department at the event. The JPD team particpated alongside 16 other teams from departments around the state, many of which from departments with officers who are dedicated full-time to SWAT operations. 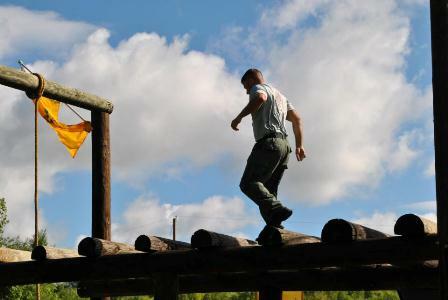 Competition included events in areas including agility and physical endurance, individual and team marksmanship, an obstacle course, and sniper competition. Jeffersonville’s team placed 8th out of 16 teams, with the Indiana State Police Emergency Response Section North Squad finishing in first place, and the ISP Central Squad finishing 2nd. View photos from the event on the City of Jeffersonville’s Facebook Page.